We all want to have a plan for our week, to reach for new heights, and accomplish amazing things while not hating ourselves. One of the best ways to reach higher is to plan for it, and it is with this spirit I created LifeSparcs.com and the SPARC process. SPARC is the specific process I developed to help people live more happy lives. Nothing too grandiose! ( Click here if you want to read more about the genesis of this process and see the LifeSparc memobook). But its not about the tool, its about the process. 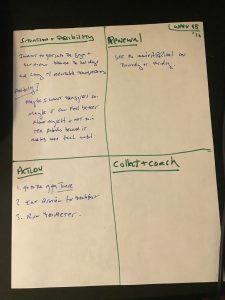 So, for this posting, we’ll be using the basics – pen and paper. Sunday is the day that I recommend you plan your week, but since I’m posting this on a Monday that works too ( Be Agile!). If you haven’t done the work to decompose your thoughts into actions, we’ll have to take a brief detour. Close your eyes and look into your mind. What’s that one thing you really want, one you might have thought you should have by now, and don’t. Is it that dream trip to Ireland? Is it a new car? A new romantic relationship? Get more fit? Whatever it is, open your eyes and write it down. 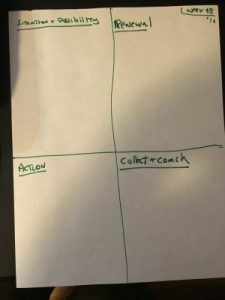 Now, take a piece of paper and draw a line down the center of it, vertically, and then draw one horizontally, dividing the paper into four quadrants. Now in the top left corner write Situation and Possibility. 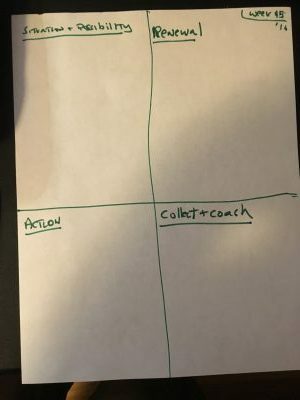 In the remaining quadrants write Action, Renew, and Collect & Coach in each quadrant respectively. This is shown below. Do this all in pen. Okay, now, google what week it is. Currently as I write this its the 45th week of the year. Every “iteration” we do in SPARC is exactly one week. This sort of cadence will make things easier. In the top right corner of the paper write this number, with the year next to it, e.g. 45th year of 2016. Great, now you have it down on paper. But so what? You go to the gym…big whoop! We have to figure out what possibility this will enable…the why behind the need. Possibility: “If I can get to the gym, I’ll feel so much better about myself, and maybe not gain ten pounds like I did last year and feel embarrassed” Better! You’ve got feeling in those statements. “Emotions drive us, not logic. Get your feels out there in the possibility section. There of course can be more than one statement in this area, but they should be motivating, not a downer. By now, your paper should look like mine does to the left. Looking down at the next sections, you’ll see Action, Renew, and Collect. Think about them together. What actions am I going to do to successfully attain the Possibility? 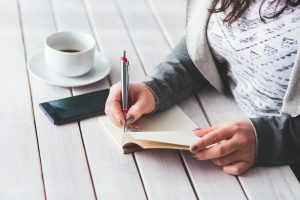 I can’t just write “go to gym” or “eat less” – these are too vague. Try to find something you can count, something that you can control. Go to the gym twice. Okay, very modest. What if we added, eat protein for breakfast instead of cereal? ( this betrays my affinity for the Paleo eating style). Okay, one more. How about – do a 400 meter run practice. I’ve done this practice before – I get on a track and burst around it like Usain Bolt (when he was toddler). But what about the R? Renewal is imperative for humans, since we are more successful in general when we can wrap an unpleasant task with one we look forward to. Carrot, not stick. So for this week, of the huge list of things I do for fun ( you have that list, right?) which will I pick? I think there’s some amazing movies coming out soon, namely Arrival (awesome!). I’ll see that one as a reward for doing these items. Now, what if I don’t get all three done by Thursday? Well, I say you do the movie anyway, since you’re working on hard stuff here. We need to refill the tank before it runs out, not after. Um, that’s it! Congrats, your planning is DONE. Now you might laugh, since that process appears too simple. But as with any good process the challenge is in the doing. This also becomes more difficult when you have a few of these. Say you’re also trying to fix the sink, and you know the family is coming over on Thanksgiving and you’re running out of time. Get out a new piece of paper, and go through this same process. Hopefully you can pin this on something more motivating that fear of embarrassment. As for collect and coaching, we’ll fill that in as we move through the week. I’ll post again this week as I progress on these totally random items that might be mine or not :). Please feel free to share some of your work below in the comments!